MIG 29 Jets – produced in Russia – were deployed by the Burmese Army as a threat against the Shan State Army North (SSA-N). As reported by Shan Herald Agency for News (SHAN) on 13 July 2011 two MIG 29 Jets, and on August 9 2011 four MIG 29 Jets flew over the SSA-N - Burmese Army battlefields. MIG29 Jets were not used to launch attacks but as a tactic to frighten SSA-N soldiers and villagers. A series of fights broke out between the Burmese army and the SSA-N as a result of SSA-N denial to accept the status of Border Guard Force as requested by the government. 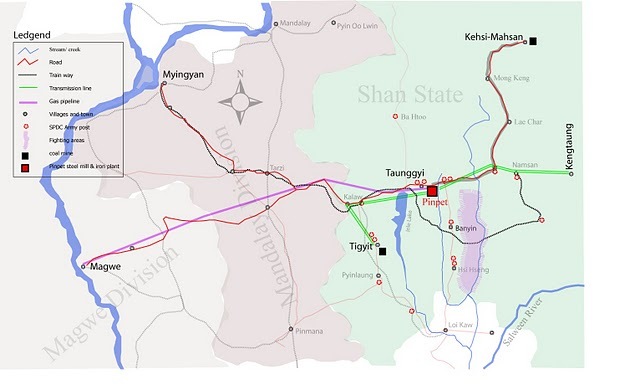 According to the Shan Women Action Network (SWAN), about 30,000 Shan refugees fled to the Thai-Burma border because of the constant fighting between SSA-N and Burmese Army. Among the battles-affected townships, Kehsi represented the most intense area, reported SHAN. 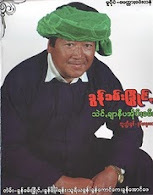 Just one year ago, on 22 March 2010, a Burma state-run newspaper, New Light of Myanmar, reported that coal mining in Wanhok village, Kehsi Township, could provide 37 Million tons of coal for the NO.5 Steel Mill Plant (Pang Pet) in Pinpet for 75 years. Therefore, in order to supply required energy power for almost completed Pinpet iron factory, the government is planning to extract the coal deposit at Kehsi Township. 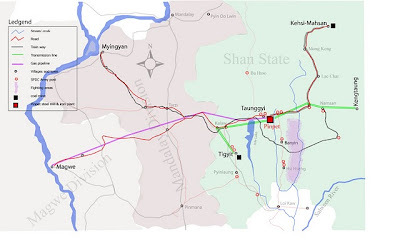 Since Kehsi Township is located in SSA-N territories, the government is trying to strengthen its control in the area by fighting the SSA-N and resorting to the Russian MIG-29 Jets to threaten SSA-N.
Pinpet iron mine is the second largest iron mine deposit in Burma located in proximity with Taunggyi, the capital of Shan State. Three major companies invested in the Pinpet ironing mining project: the Russian state-controlled Tyazhproexport Company, Danieli (Italian company) and the Myanmar Economic Commission. Required energy to run the Pinpet iron factory will be provided not only with the coal extracted in Kehsi Township but also with the energy produced by Tigyit coal powerplant and Kyitetaung hydropower plant and with gas from Magawe Main station. Pinpet iron project represents a major threat for the population settled in nearby areas. Upon the completion of the Pinpet iron factory, Thabet creek will be blocked and water will be transported from the creek to the factory for iron purification with two 21 inches wide pipes. After usage, drain water will be released back into Thabet creek with three feet wide pipe. About 35,000 local people in Hopone valley depend on Thabet creek for agriculture, transportation, fishing, livelihoods and daily use. When the factory will begin to run and toxic waste water from the factory is released back into Thabet creek, people living in Thabet creek downstream will suffer the impacts. Moreover, about 953.64 acres of farming lands and 6,000 acres of woodland were confiscated for the Pinpet iron mine project; 20 families were forced to relocate from Ponzin, Katkaw and Naungkakel villages; three ancient community pagodas were destroyed for the mining and factory sites. In 2009, Pa-Oh Youth Organization (PYO) published a report titled “Robbing the Future” to underline the negative impacts of Pinpet iron mining and iron factory on the local community. As also mentioned by the report, rumors have arisen from the villagers and the factory’s employees that the Pinpet mine, besides iron, produces also uranium.